In Part 1, you learned about how to find a property to ensure you’ll appeal to renters who will keep the income flowing. In Part 2, you learned about how to effectively decorate and outfit your cottage investment property in Ontario. In this series, we’ll cover how to go about marketing your property and common pitfalls to avoid. Even if you’ve done everything perfectly up until this point – you’ve got a great property and it shows beautifully, you can still seriously miss the mark when marketing it! As with how you decorated your cottage, you need to approach marketing it from the same perspective, as if you were selling it. In order to get top dollar and attract the type of renters that are going to take care of your cottage, you need to invest some money to get it picture perfect. Picture Perfect – Sell a Vacation! Use a wide angle lens or at least stand as far back as you can, so that the picture gets as much of the room as possible. Make sure the photos are super bright! Turn on every single light in the cottage and take them with as much natural light as possible. You will likely need to edit them to brighten if you don’t have a good camera. Make sure the cottage is absolutely pristine. Beds are neatly made with nice decorative pillows, nothing on the counters or tables, toilet seats are closed, blinds are all open, throw pillows are tidy. More is better! Take a photo of every single room in the cottage and from a different angle if needed. Ensure you have lots of exterior pictures as well, especially of eating areas, lounging areas, views and the waterfront. Include photos of all the amenities your cottage has to offer – like fire pits, hot tubs, badminton net, basketball net, dock, water toys, etc. Take a photo of the cottage from the water, to give renters that perspective as well. Take exterior photos during different seasons so encourage rentals in the fall and winter as well. The fall foliage in cottage country is stunning and so is a huge fresh snowfall! The more photos you include and the higher the quality, the more confident prospective renters will be. People do not like surprises and most will skip over your property if your marketing does not give them enough information to make a commitment. To take it a step further, include floor plans or a virtual tour – that will really impress renters! Remember you’re selling a vacation and an experience. Don’t underestimate how important great pictures are. To make your cottage rental truly feel like a vacation destination, create a logo for your cottage and carry that branding throughout all your marketing efforts – website, rental applications, contracts, communications and on signs throughout the property. Just as important as pictures, is your description of your vacation oasis. Don’t go over the top, so that readers need crackers to go with your cheese, but add some flair! Remember that your goal is to describe the property, but don’t forget to sell the experience while doing so. 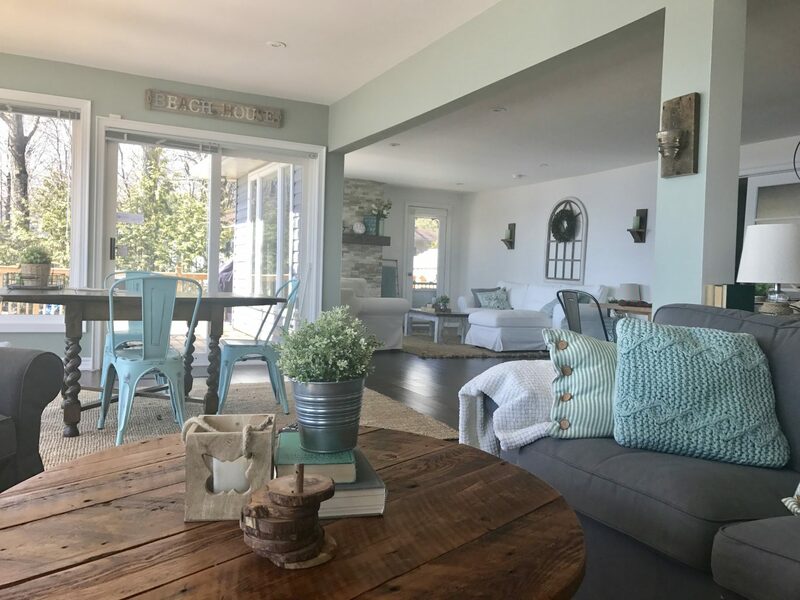 Instead of saying “The cottage features a large living room” say “The cozy living room overlooking the water with beautiful views, is large enough for the entire family to gather around and play a game of charades.” Describe the rooms, but also tell them how they can use the space. Make sure you also address how the property is suited to different ages. If it is not suitable for young toddlers, say so! Nothing ruins a vacation more than parents who can never relax because they’re constantly having to prevent their toddler from falling down a cliff. Never misrepresent anything! You’re much better off being honest and communicating any downsides of your cottage. Surprises will only result in bad online reviews (which can kill your future rental abilities) or a cancelled booking and demand for a refund. Get inspired by visiting resort and lodge websites to see how they describe their vacation properties and steal a page out of their book. How to Price your Rental Cottage? The easiest way is to just check out your competition. Find other local rentals that have similar features and amenities and adjust your weekly amount accordingly. I personally recommend that you discount a little your first year or two renting. Over deliver the value and your renters will be singing your praises about their vacation with glowing reviews online. That will make it much easier to rent in the future and you can increase your weekly rate at that point. Pick one or two of the big rental websites that have high traffic. They have great exposure to a broad range of prospective renters all over the world. Most charge an annual fee to list your cottage, but others charge a % fee which can be more expensive, if you have a high-end property. With this option, you need to do all the work yourself vetting renters, checking references, creating contracts and communicating with your renters before and during their stay. It’s not for the time-starved, but it can keep $$$ in your pocket. My favourite is Cottages in Canada. If you’d prefer to rent your cottage to friends & family or just referrals, then I highly recommend having your own cottage website. This will give you a place to put all the necessary information promoting your property, but also pages that include cottage instructions, local amenities, etc. Although it may sound intimidating to someone who knows nothing about website development, there are lots of template options out there that would be inexpensive to implement. Once you’ve got a website, advertising it on social media platforms such as Facebook is a breeze and can reach beyond just your own network. Your other option, is to hire a company to manage everything for you beginning to end. They list the property, vet renters, manage contracts, communicate with renters and in some cases do property management as well, if something were to go wrong at the cottage. These companies are often local – so do a search specific to where your cottage is located. Some people do not like the idea of renting their beloved cottage to strangers and would rather have people they know using it. The logic is often an expectation that they will treat it better, which is usually true. However, keep in mind if anything does go wrong – either they are not happy about something or they damage something, it can be much more awkward to handle. 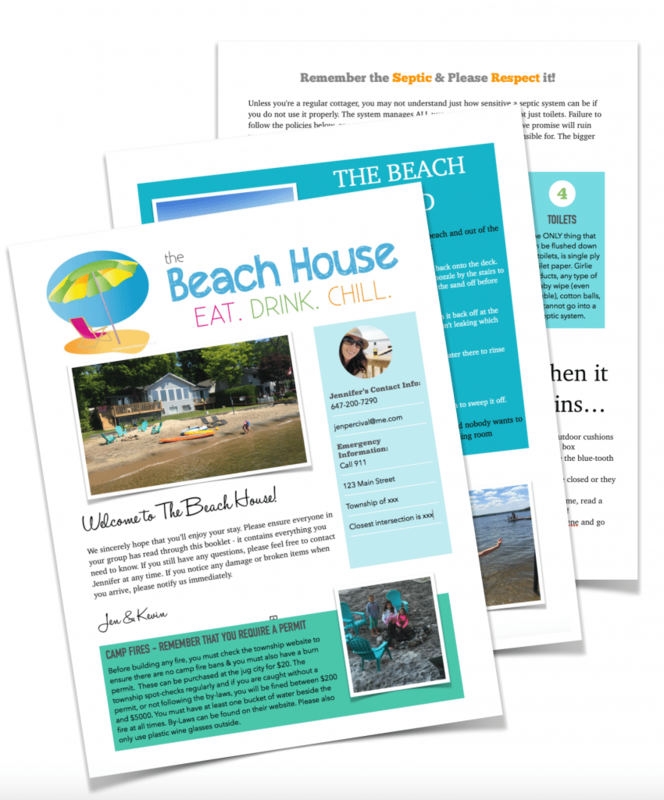 We have a customized Cottage Communication Kit available for $99 that includes an online rental application, email templates, cottage information booklet & signage for the property. We can also provide a template for your rental contract that can be adjusted to suit your needs. Now that you have promoted your cottage rental property effectively, the phone has started to ring! What now? How do you ensure a smooth rental process? Do your due diligence, communicate the details and protect your investment. Insurance – if you’re going to be renting your cottage, you absolutely need to have the right insurance. There are lots of options out there, but this company specializes in this type of coverage in Ontario. Rental Application – having a thorough rental application is imperative, as is checking references. Rental Contract – every cottage property is different, so it is imperative that you develop a contract that covers particulars of your property. It is also highly recommended that you have a lawyer review your contract, to ensure it will protect you. There is nothing more frustrating than trying to secure a property for your summer vacation and the property owner takes days to respond. If you want to have a successful and profitable rental property, you need to be responsive! People are so appreciative when you get back to them quickly and it will set their vacation off on the right foot from day one. When they’re happy with the experience before even stepping foot in your property, they will often be more flexible and understanding if anything does go wrong. So make a commitment to respond to any questions, concerns, etc. as quickly as possible, but for sure same day. directions and tips on where to grocery shop, etc. 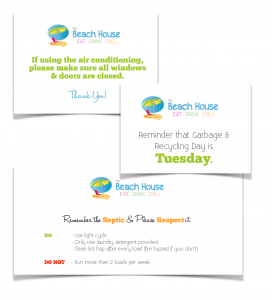 Lastly, it’s wise to place small signs throughout the property with reminders, instructions for use, etc. It’s difficult to cover every single detail, but hopefully this blog gave you lots of helpful information! If you’d like a referral to a great realtor where you’re looking or you’d like to purchase one of our Cottage Communication Kits, please contact me.